I had some free time today so thought I’d do up my next blog to let everyone know what’s been happening lately. Training’s been going really well, my brothers and I have been putting in some big kms recently as this is going to be my last real ‘big’ block of training I’ll get in before my record attempt of the English Channel in September. Normally when I’m in big blocks of training like this I always lose weight. This block of training I’ve been trying harder than ever to put weight on. It’s ridiculous how much food I’ve been eating! I’ve put 3 kgs on since March and I’d like to put at least another 6 or 7kgs on before I take on the Channel. Everyone I’ve ever talked to who has swam the Channel in the past has told me the most important thing is to put on extra body weight in the lead up. Obviously the more body weight you have the warmer it’s going to keep your core body temperature and the lesser chance you have of suffering from hypothermia. When you’re swimming in cold water (16 degrees) for close to 7 hours, suffering hypothermia is a real chance! Five weeks ago Ridge (my youngest brother) and I started our Personal Training course - Cert III and IV in Fitness at The College of Health and Fitness. It’s an eight week full time course, so we only have three weeks to go, the finish line’s in sight! Doing this course has honestly been the best thing I have ever done. I’ve learnt so much about the human body that being a professional athlete I guess I should have already known. Two weekends ago I competed in the Eyeline Noosa Blue Ocean Swim. Now this is the richest ocean swim in Queensland at the moment so the competition is always tough at this event. For the third time this year my brothers and I got a clean sweep of the podium - Ridge was third, Codie second and I won! Click ‘here’ for the post-race article. The next day was the Byron Bay Ocean Swim. This year the race drew around 2000 competitors. This is normally a great race and organized really well, however this year the organizers had waited until everyone was on the start line in togs with cap and goggles in hand before they announced the race would be called off due to bad conditions. You can’t have close to 2000 competitors on the start line before you call off a race and not expect them to still swim. 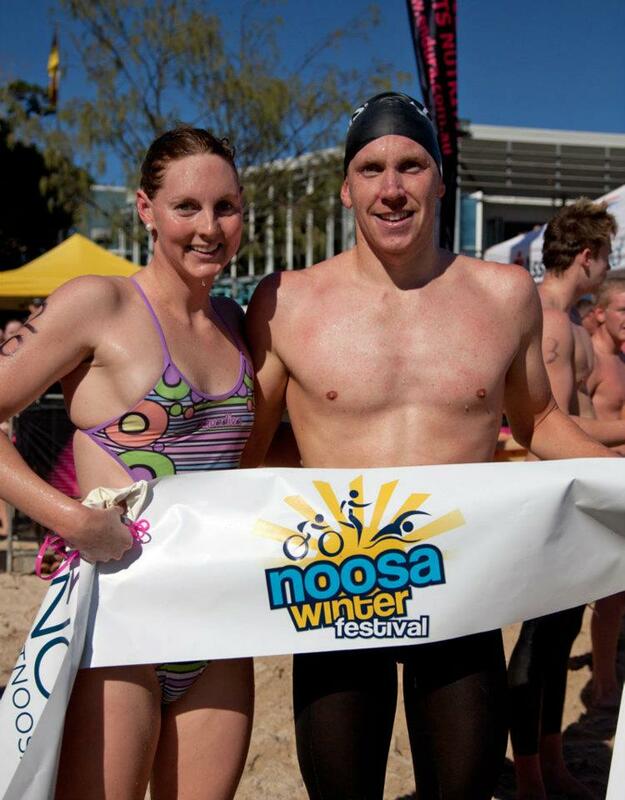 In true ocean swimming sprit about 1000 people still swam regardless… I was one of them. I’ve had a few changes lately. As of last week I have started with a new strength and conditioning program. I’ll now be doing all my strength and conditioning out of The College of Health and Fitness, being overseen by Tony Attridge and his team. I have also teamed up recently with Glen Duggan from VoloSport. Glen will now be looking after my management side of things, while I can do what I do best… race hard! Next week I’ll be traveling to New Caledonia with the Australian Swim Team to compete in the 2012 Oceania Championships. 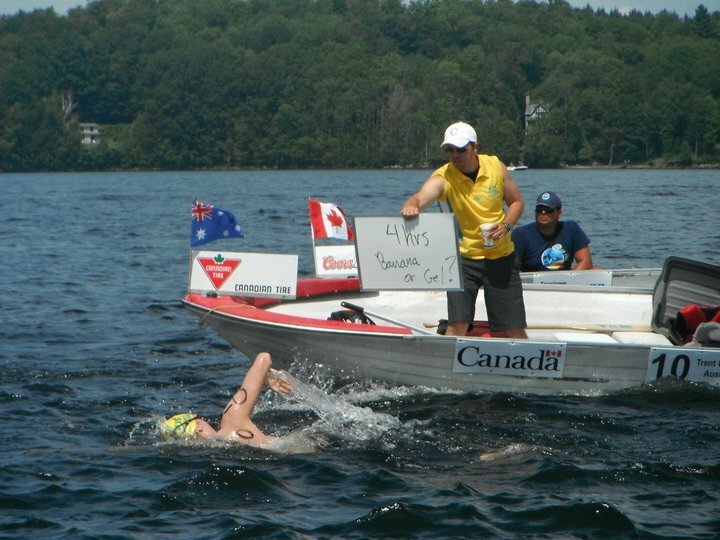 I’ll be racing in the 5km and 10km Open Water events as well as the 1500m freestyle. For me Oceania is not super important so I’ll be training through but it is always good to have a hit out while in hard training to see where you’re at. I think i'll still swim pretty fast though! 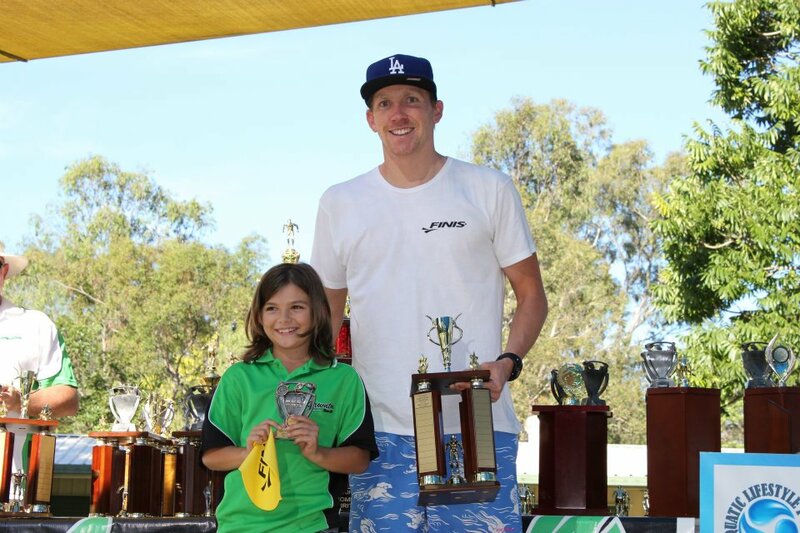 Persenting the Trent Grimsey trophy at Lawnton Swim Clubs presentation day!